• Spanish PM Zapatero says government will never respond to actions of terrorists. • ETA says government met its cease-fire "with arrests, torture and persecution"
MADRID, Spain (CNN) -- Basque separatist group ETA called off a unilateral cease-fire it declared more than a year ago, a statement published in a Basque newspaper said on Tuesday. The ETA statement was published overnight in the Basque-language newspaper Berria and it warned of attacks resuming as early as midnight Tuesday (6 p.m. ET). The announcement came a day after Spain's largest-circulation newspaper, El Pais, published a story, citing police and intelligence services, warning of imminent new ETA attacks. Government ministers huddled Tuesday morning to address developments, CNN's sister network CNN Plus reported. In a nationally televised statement after the meeting, Prime Minister Jose Luis Rodriguez Zapatero said the Spanish government would never respond to the actions of terrorists. Reacting to ETA's announcement, Basque politician Javier Madrazo said in an interview with Spanish radio network SER that "ETA always blames others when it breaks a cease-fire. But they're the only ones to blame." 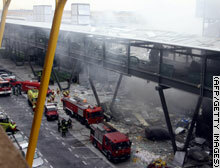 Much of Spain had already considered the cease-fire dead following a December 2006 ETA car bombing at a parking garage at the Madrid airport, which killed two people. Prior to the December 30 airport bombing, ETA had not killed anyone since 2003. After the blast, the government announced that it considered the peace process finished, although ETA later issued a statement saying its cease-fire was still in force. But after the bombing, the Spanish government said it would no longer trust any future ETA cease-fire announcements and instead would expect the group to make a pledge to end violence and lay down its arms. The ruling Socialists and the opposition conservatives have long been at odds over policy towards ETA. The conservatives have argued that the rule of law and police crackdowns are enough, while Socialists have said that those measures combined with possible dialogue after a commitment to end violence would be better. The cease-fire was a unilateral ETA initiative -- one to which the government never agreed. Spanish police continued to arrest group members, upsetting ETA leadership, which called the arrests "aggressions," claiming ETA prisoners had been tortured. In late March, Spanish and French authorities arrested 10 suspected members of the Basque group in what police called a blow to ETA's "infrastructure." A total of 21 ETA suspects have been detained this year, including 10 in Spain and 11 in France, the Spanish Interior Ministry recently said. About 500 people -- including convicted ETA operatives and suspects awaiting trial -- are in Spanish jails and an estimated 100 more are in French jails, authorities have told CNN. ETA's announcement of a unilateral, "permanent" cease-fire on March 22, 2006 initially raised hopes for an end to nearly 40 years of ETA violence, which is blamed for more than 800 deaths. 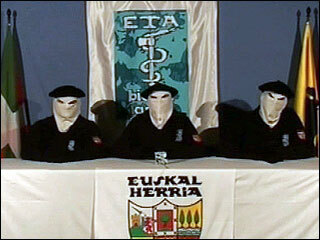 ETA wants Basque independence and is listed as a terrorist group by the United States and the European Union. Fireman at work in a Madrid airport car park following an ETA attack in December which killed two people.